sassyfrazz: Mother's Cookies~ brings me back to my Grandma's! Going to Grandma's house was such a fun time. 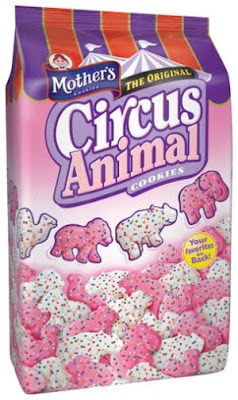 We usually had treats at Grandma's that our mom didn't buy, and one of those was the Mother's Cookies~ Circus Animals. I loved these cookies! I thought the animals were so fun, and we love to see if we could recognize which animal it was. I remember separating the pink animals from the white, and then categorizing the animals from biggest to smallest, or the one that had the most strength. It was also fun to bite off their trunks, legs, or ears. I know that is a bit weird, but that is what I did. Well, Mother's Cookies haven't been around for years, but now they are back! Seems like a lot of things that I grew up with is returning. I love that, because my kids get to experience some of the same products, items that I grew up loving. I was so excited to let my kids try out the Circus Cookies. They loved them. They like to have both colors given to them. My daughter prefers the pink ones, however. It is fun to talk about the animals when they enjoy their snack, and we talk about making a trip to the zoo to see the animals. They love the Mother's Cookies~ Circus Animals. I am excited to try out the other varieties, as well. Another one of my favorite Mother's Cookies is the Iced Oatmeal! My Grandma would buy these cookies once in awhile, too...and I remember they didn't last long. I am so happy that the Mother's Cookies are back in the area and my family can enjoy them like I did as a child. We were so excited to review for the Mother's Cookies, and our family happily recommends them to you! If you are in the Midwest area, you can find these delicious cookies in your stores. Amazon storefront also carries Mother’s Cookies if they aren't available in stores near you: Amazon.com. I wrote this review while participating in a blog tour campaign by Mom Central on behalf of Mother’s Cookies and received two bags of cookies and a $20 Amazon gift certificate to facilitate my review.